This section is under develpment. Anyone can submit their "famous" Harlan sites to: Becky Hines for possible inclusion. Mount Pleasant, a city of 8,500, is in the southeastern corner of Iowa, a region of rolling hills and farm fields, twenty-eight miles west of Burlington and the Mississippi River. James Harlan built the extant house onto the front of an earlier residence when he returned to Mount Pleasant after his service in Washington, D.C. The house is situated on the north edge of the Iowa Wesleyan College campus, a reminder of James Harlan's presence at the college and community. Harlan served as president of Iowa Wesleyan, as professor, and as trustee. Harlan's daughter, Mary, married Abraham Lincoln's son, Robert Todd Lincoln, in 1868 in Washington, D.C. During the 1870s and 1880s, Mary Harlan Lincoln brought their three children, Mary, Abraham Lincoln II "Jack", and Jessie, to spend summers with the Harlan grandparents. She said Mount Pleasant was "restful and good for the children growing up." At the time, Robert was an attorney in Chicago and took the train to Mount Pleasant to spend time with his family. Senator Harlan deeded the property to the Robert Todd Lincolns in 1895, and Mary made improvements to the house, including a wraparound front porch. She hosted two catered parties in the fall of 1895, welcoming people from the college and community to her home. By 1907, with her parents no longer living and the family having built a home in Manchester, VT, Mary Harlan Lincoln gave the house to Iowa Wesleyan College as a tribute to the memory of her father. Since 1959, the college has maintained the Harlan-Lincoln House as a museum. The museum includes artifacts belonging to the Harlan and Lincoln families: a fragment of the coat Abraham Lincoln was wearing when he was assassinated; Mary Todd Lincoln's mourning veil; Harlan's desk, globe, and recliner; a door measuring the heights of the grandchildren in 1883; grandson Jack's rock collection and tennis net; family silver, dishes, books, furniture, and clothing. The Harlan-Lincoln House tells visitors the story of the James Harlan family from when James and Ann Harlan built their home through when their great-grandchildren visited there. For more information or to arrange for a tour, contact Lynn Ellsworth, archivist for Iowa Wesleyan College and Executive Director of the Harlan-Lincoln House Renovation Committee, at 319-385-6320 or < iwcarch@iwc.edu >. The Harlan-Lincoln House Renovation Committee is committed to the development of the Harlan-Lincoln House as an educational and cultural resource. 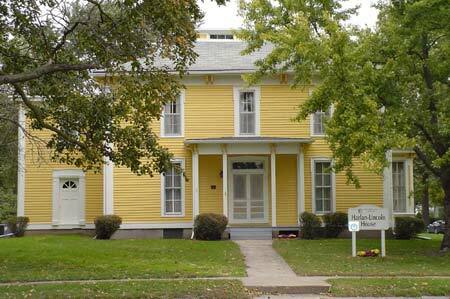 The Harlan-Lincoln House has been endorsed by the State Historical Society of Iowa in the form of two grant awards. The family lineage is: George #3, Aaron #8, Samuel #40, George #189, Samuel #688, James #2319, John William Harlin, John C. Harlin (who built the house), Hugh Tan Harlin, John L. Harlin and Chris Harlin. John William Harlin moved from Monroe County, Kentucky, to Gainesville in 1869. According to Alpheus Harlan's genealogy book, some of Samuel's (#688) children and grandchildren spelled their surnames as "Harlin" and "Harling," though Samuel's listing in the book is "Harlan." 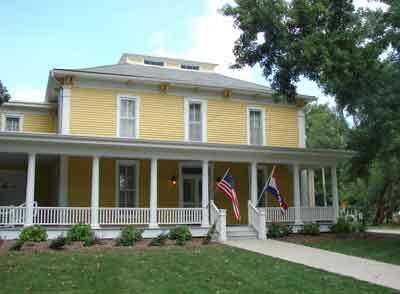 Visit the Old Harlin House Web site to view the progress of the ambitious restoration. 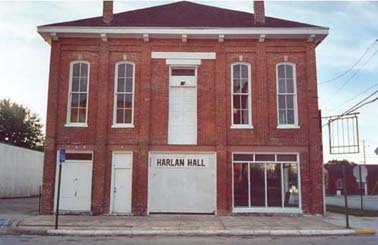 In 2001, the city of Marshall, Ill. purchased an opera house built in the mid-1800s and named it Harlan Hall for its builder, Howard Harlan #5737. 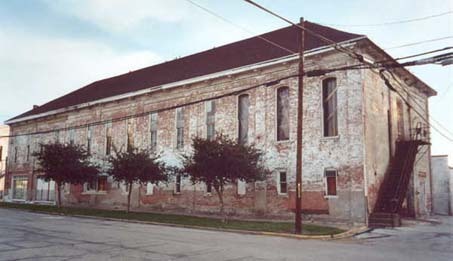 It has recently been added to the National Register of Historic Places. The City of Marshall is in the process of restoring the building and making it a community center. Downstairs--once a brick livery stable built by Howard in 1871--will be a senior center. The opera house upstairs will have a full working theater and there are plans to locate a small museum, which will feature the building, on an original balcony. Another possibility for Harlan Hall is the location of an interpretive center concerning the heritage of the National Road, sponsored by the National Road Association. 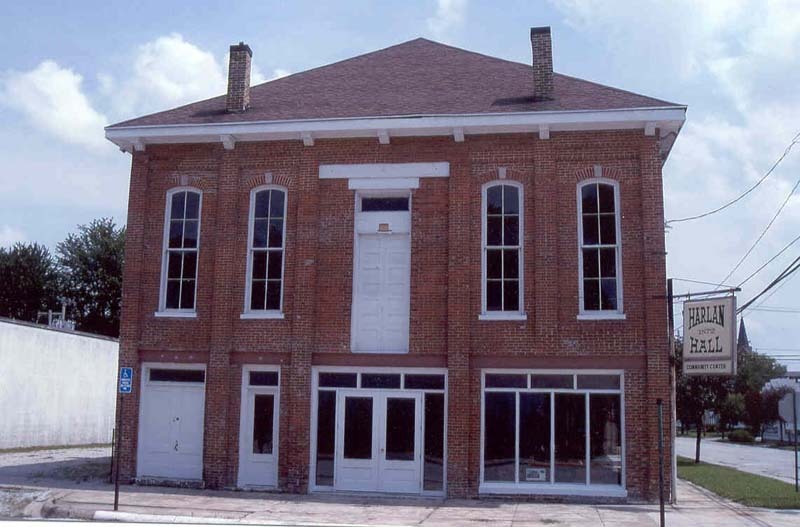 Anyone wanting to tour Harlan Hall and see the progress of its restoration is invited to contact Elizabeth Richey, secretary of Marshall, at 217-826-8087, M-F. The first floor was a stable for the horses with an entry under the fire escape. The horses hung their heads out of the first floor windows. 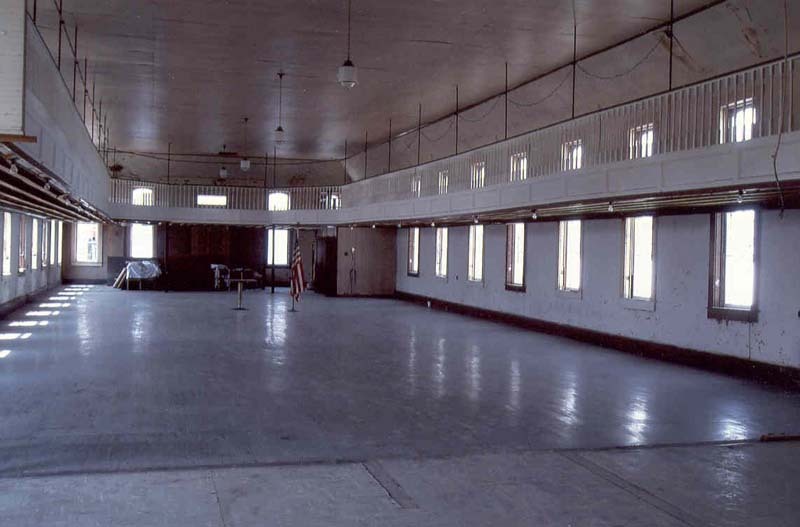 Numerous stage-type events were held on the second floor. During the American Revolutionary War, General George Washington and The Marquis de LaFayette, a young French volunteer, established headquarters in two farmhouses near Chadds Ford where the British were expected to cross the river. Washington held a council of war with his generals in the home of Benjamin Ring to plan his strategy and nearby, General LaFayette and his officers quartered in the house of Gideon Gilpin, a Quaker farmer. Gideon Gilpin was married to Sarah Gregg (#240), the great-granddaughter of George Harlan (#3). The Gilpins were a prominent Quaker farm family and by religious persuasion, they were opposed to war. When their home was commandeered, the family found itself unwittingly embroiled in the bitter action. At the time of the battle, five of their seven children were living there. LaFayette was wounded on the second day of fighting. The British outmaneuvered the Americans in spite of a valiant fight on the rolling hills along the Brandywine River. The defeated Americans retreated to Chester but were not demoralized as they believed their downfall was because of unfamiliarity with the landscape and not the result of poor fighting. After the battle, the Gilpin property was plundered by foraging British soldiers. Gilpin filed a claim for losses that included 10 milk cows, 1 yoke of oxen, 48 sheep, 28 swine, 12 tons of hay, 230 bushels of wheat, 50 pounds of bacon, a history book and one gun. According to "The History of Chester County" by Futhey and Cope, "Forty-eight years later, General LaFayette returned to America and Chester County amid much ceremony and honor on the invitation of President Monroe. During his tour, LaFayette insisted upon calling upon the Gilpin family at their Chadds Ford home. He found Gideon aged, ill and abed. 'The sick man was gratified at the sight of the veteran, who pressed his hand cordially and wished him every blessing.'" Sarah Gregg Gilpins mother was Ann Robinson Gregg (#55), and her grandmother was Elizabeth Harlan Robinson (#12)the eighth child of George Harlan and Elizabeth Duck. 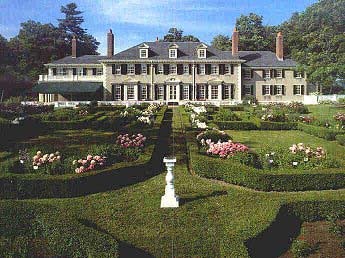 In the picturesque village of Manchester, Vermont, sits a 24-room Georgian Revival mansion, built for Robert Todd Lincoln and his family beginning in 1902. Robert's wife, Mary, was the daughter of Senator James Harlan of Mt.Pleasant, Iowa. The last Harlan-Lincoln descendant at Hildene was Mary Lincoln Beckwith, granddaughter of Robert and Mary, who resided there until her death in 1975. The name Hildene comes from "hill and valley", and this imposing home with its formal gardens was a quiet refuge for the Lincoln family. Much of the furniture and personal effects came from the Harlan family home in Iowa and are now on display. An Aeolian Pipe Organ with a player attachment still in working order was installed in 1908 at a cost of $11,500. In 1980 the organ was completely restored. This 18th Century Quaker farmhouse sits on 200 acres deeded from George Harlan to his son, Joshua. The transfer was made to Joshua "in consideration of Fatherly love and affection." Now listed on the National Register of Historic Places, the serene five acre setting is just three miles from Winterthur Museum, Longwood Gardens, the Brandywine River Museum and the Chadds Ford Winery. Features include bedroom fireplaces, private baths, gardens, antiques, canopy beds, an 1814 spring house and a sitting porch with rustic rockers. Currently it is a residence as well as a Bed & Breakfast guest house. A study of the ownership of the house contradicts an earlier opinion that this was Michael's residence. It is now believed that George acquired the land in 1710, and the oldest section of the house, made of logs, was built about 1715-1720. The middle section of the house was added in 1835, and a much newer section has been attached to this part. Harlans attending Celebration 300 in 1987 were able to tour the house and fondly remember its charm as well as refreshments served by the residents' children. Blue Licks Battlefield State Park, consisting of 148 acres, is located approximately 43 miles northeast of Lexington, KY, on U.S. Highway 68 (formerly a buffalo trace). The last Revolutionary War engagement fought in Kentucky took place on this site August 29, 1782. The British Captain William Caldwell had gathered a band of some 500 Indians and led raids on several unprotected outpost settlements including Bryan's Station, located five miles northeast of Lexington. After three days of futile fighting, the Indians began a retreat to the Ohio border. The Kentucky volunteers followed in pursuit and were ambushed at Blue Licks in a short battle, being outnumbered three to one. Sixty men were killed including three of the commanders, Colonels Todd and Trigg and Major Silas Harlan (see story of Silas Harlan in Whos Who in Harlans), and Daniel Boone's second son. Silas was buried on the south side of the Licking River at the Blue Licks, so named for a fine salt spring. In addition to historical markers at the park, a granite obelisk commemorates the battle, and a large granite marker identifies the grounds in which the volunteers are buried. A museum is located in the park which contains Indian and pioneer relics, bones of pre-historic animals found nearby, old gun and glassware collections and an audio-visual program of the frontier. In front of the courthouse in Harlan County, Kentucky, is an historical marker that reads: "County named 1819 for Major Silas Harlan, born in Virginia 1752, came to Kentucky in 1774. Built Harlan's Station 7 miles south of Harrodsburg on the Salt River, 1778. Commanded spies, 1779, in Illinois Campaign of General George Rogers Clark who said: 'He was one of the bravest soldiers that ever fought by my side.' Killed 1782 at the Battle of Blue Lick while commanding his detachment. Buried at Blue Licks." There is no record that Silas ever set foot in what became Harlan County. The oldest structure built by George Harlan (#45) in the 1740's was the first part of his home, a log cabin with an immense 5 feet X 9 feet stone fireplace. The single oak beam across the top measures 16 inches X 21inches (to go with the 9 foot length). Its sheer size amazes everyone who sees it. Keith McClung was the master carpenter who directed the renovation of this wing last summer. Being a builder, Keith recognized early on many small things that told a history the rest of us didn't see. 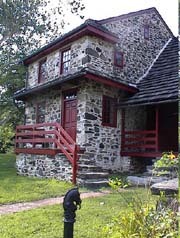 It was clear, for example, that the stone lean-to facing Harlan Spring was built after the log room. It has 20 foot stone walls, a small door, and two windows, but until this summer, it had practically no roof. The original, probably wood shingle, had been replaced with a makeshift metal roof which had rusted and sat on a minimal support of a few beams. Keith replaced it with "the best roof you can get," a standing seam tin roof, a very common roof around here for many decades past. His instructions were to put his energy into the log kitchen, for though the stone room could be finished inside some day, it was not necessary now. But Keith is a perfectionist, a professional of the first order. He didn't leave the stone room till he had the floor cleared of accumulated debris, setting it up for some future finished floor. The stone room had always been assumed to be just a storage place for the wood of the fireplace next door. (But why was it built so substantially for firewood?) Keith and his men shovelled down 24 inches before finding solid earth. What they found in the process was quite extraordinary. You should keep in mind here that I was at that moment in the hospital with major surgery. While still emerging from anesthesia the phone by the hospital bed rang and it was Keith. "How are you? I'm calling you from your living room and I have the most exciting news! We were digging out the floor of the stone room. We had to go down 24 feet before finding solid earth. We began to find coins, jewelry, a clay pipe, and pieces of dishes. Then we dug some more and got to a layer of manure! After that we eventually found underneath everything a wooden floor with boards over logs! At that point the wood was so rotten it just crumbled! Yet even, then, under the bottom logs some coins were found!" One of the coins was an 1813 penny. The next week I hobbled home to see for myself the always fascinating restoration. Keith presented me with a mounted and framed collection of the best samples of the Harlan "debris." Being an artist, he did it very well. And with this I also learned what a great human being he was. With his help we have learned the stone room had far more importance to the family than we had imagined. Keith's framed collection will be on exhibit for the Harlan Homecoming. They were not intrinsically valuable, but they were each known very much by heart to the family. Old farm tools, kitchen utensils, personal objects, remnants of life before electronics like a mechanical device for making socks, a butter urn, a Civil War bayonet (found in the pasture), an iron bed, and a magnificent sleigh that took Jean and Douglass Harlan to school in the winter. "Now, I want you all to come down to the stable and see what a great collection we have," Dougie (Douglass Harlan) would say after dinner. We would all go down the hill to the little stable our grandfather (Dougie's father) had built when he had to retire from farming but wanted to do a modest amount of it on the side. It is a gem of a building, oak (of course) but with a slate roof! It had a couple of stalls for the horses in the bottom and a loft upstairs for hay. Though on the low side of a hill behind Overlook, the retirement home, it still had an unexpectedly wonderful view of the mountains. (What an artist's studio it would have made.) Up in the loft were all these things spread out. We were so glad they existed, but never gave them much thought except to feel assured they were in the old stable. Visiting them was an occasional excercise, but in the past decade, especially, the groundhogs had so undermined the foundation that the building should now be called the "unstable." I was afraid to go in at all because of how the structure was twisted. Nonetheless, it stands to this very day, slate roof and all. Recently, however, the people who now rent Overlook said they had been to the stable and that all the Harlan artifacts had been cleaned out! Stolen! Forever gone! And not much worth to the thief, at that. But such a loss to all of us. It is with pain that we confess it to you. The moral of this story is that in the modern world, more and more, tangible things are fragile. They are subject to theft or destruction or loss in any number of ways. It is true of the old rakes in the loft. It is true of Harlan Farm itself. All Harlan descendants in the United States are invited to return for a visit to one of the oldest Harlan estates next Memorial Day weekend, May 1998. Spring Hill, the house built by the earliest Harlans to arrive in the Northern Shenandoah Valley of Virginia in the 1740s, was the home of George #45. It is perhaps the only Harlan land remaining in the country that has never left the family. As the name implies, the house is on a hill above a spring--Harlan Spring. It seems obvious that they laid claim to this spot largely due to the value of the spring. In the beginning the Harlan family owned well over 1,000 acres. The present farm is about 250 acres. A project this summer has been to clear that hillside of growth so that we have restored the old view of the spring from the house. That sight/site is magnificent to behold. We hope that while you visit you might have the pleasure of witnessing the circling and landing of a flock of Canada Geese on that pond. A whole family of them hatched in the pasture spring before last, so they are also "Harlans"! This summer has also been spent in renovation of the oldest part of the house. The original room is a log room with a 5 X 9 fireplace. To it was added a stone room with 20" walls. On the other side, at some later date, was built what is now the main house-- a two story log and lathe building with a full attic. Then, in later years, a small brick room was added. (We have never known the precise year of any of the building.) The whole house, except for the stone room, is parged, which I have learned from fascinating observation of the contractors working, is a coating of cement about an inch thick. The cement during my lifetime was always painted white. But some with a longer memory have commented that it once was off-white. We have just painted it cream to match the yellow in some of the stones, and the repointing of the chimney. The parging, as you can imagine, completely covers the construction elements, so that you cannot guess from looking on the outside that one room is log, another brick, etc. The interior of the house has not, to date, been altered except for installing the modern conveniences of baseboard oil heat (which closed up the fireplaces!) and a bathroom in the main hall under the staircase (which, alas, has ruined the exposure of the suspension of the stairs all the way to the attic). These compromises were done to enable someone to live with some comfort in the house, which is the best security the house can have. The year after his birth in Kennet Township, Chester County, Pa., around 1752, Aaron Harlan (#194) moved with his parents (Aaron Harlan and Sarah Hollingsworth) to Chatham County, N.C. He married Elizabeth Stuart and around 1781, the family settled on a farm in Laurens District, S,C., where Aaron and Elizabeth are buried. Joseph, son of Aaron (#194) and Sarah, and his family emigrated to Robertson County, Texas, in 1837, shortly after Texas gained independence from Mexico. Son Alpheus was a 7-year-old when the family moved to the wilds of Texas. Alpheus married Margaret Powell, and their third child, Mary Jane, was born in 1866 to a then successful planter. She lived a pretty sheltered life in reasonably civilized Robertson County before being wooed by Joseph James Barton. Many love letters written by J. J. Barton to Mary Jane still exist. About five years after they married, J. J. took his wife on to the High Plains of Texasthe "Staked Plains" or Llano Estacado, as they were called by the Conquistadors. It was a very barren, "godforsaken" place and had been controlled by the Comanches a few years earlier. After a number of years of very primitive living, they became successful and built a town and large house. Later they lost the town and most everything else when the railroad didn't come through, and two blizzards killed most of their cattle. Eventually only the big house was left, which became my grandparents' home, and I played there as a child. My grandmother Mary Jane donated it to the National Ranching Heritage Center in Lubbock, Texas, at her death, and it was moved 40 miles to its current resting place. My ancestors were all willing to move to the frontier in hopes of more and better land. They were adventurous, self-confident and deeply religious, mostly Baptist and Methodist, with a few preachers tossed in here & there. (J. J. Barton's maternal grandfather was a Methodist Circuit Rider in early Texas.) They were all farmers or planters, and all had big families. Mary Jane was Baptist, and Joe was Methodist. They struggled with this difference their whole marriage and apparently never reached agreement. The couple lost four of eight children, two when small and two as adults. One daughter was college age and in an attempt to save her health, the whole family moved to a different climate, but it didn't help. Their first born died in WW I a week before the Armistice. (#8)Aaron(#41)Aaron(#194)Joseph (#711)Alpheus(#2390)Mary Jane (#6129), who married Joseph James James Barton.